His career has skyrocketed into super stardom in just a few short years, and now Post Malone, the 23-year old recording artist from Grapevine, is walking into the 2019 Grammys with four nominations including album and record of the year. CBS 11 sat down with his father, Rich Post, at the family’s home in Grapevine to talk about his son’s major success. MTV was launched on 8/1/81…Do you remember? Win two tickets to see Don McLean and Judy Collins!! The Arena Theatre proudly presents two enduring icons of the folk movement of the sixties and early seventies in one concert: Don McLean and Judy Collins on Friday January 29, 2016! Judy Collins has inspired audiences with sublime vocals, boldly vulnerable personal life triumphs, and a firm commitment to social activism. In the 1960s, she evoked both the idealism and steely determination of a generation united against social and environmental injustices. Five decades later, her luminescent presence shines brightly as new generations bask in the glow of her iconic 50-album body of work, and heed inspiration from her spiritual discipline to thrive in the music industry for half a century. The award-winning singer-songwriter is esteemed for her imaginative interpretations of traditional and contemporary folk standards and her own poetically poignant original compositions. Her stunning rendition of Joni Mitchell’s “Both Sides Now” from her landmark 1967 album, Wildflowers, has been entered into the Grammy Hall of Fame. Judy’s dreamy and sweetly intimate version of “Send in the Clowns” won “Song of the Year” at the 1975 Grammy Awards. Judy began her impressive music career at 13 as a piano prodigy, but the hardluck tales and rugged sensitivity of folk revival music by artists such as Woody Guthrie and Pete Seeger seduced her away from a life as a concert pianist. In 1961, she released her masterful debut, “A Maid of Constant Sorrow.” As a tastemaker within the thriving Greenwich Village folk community, she brought other singer-songwriters to a wider audience, including Leonard Cohen, Joni Mitchell, and Randy Newman. Throughout the 60s, 70s, 80s, 90s, and up to the present, she has remained a vital artist, enriching her catalog with critically acclaimed albums while balancing a robust touring schedule. This year she released her first studio album in four years, “Strangers Again,” with a cast of icons and young talents from Willie Nelson, Jackson Browne and Jeff Bridges to Glen Hansard, Ari Hest and Bhi Bhiman. WIN two tickets to see these legends LIVE at the Arena Theater on January 29! Email us and you will be entered to WIN! Contest ends at noon on Monday January 25, 2016. One email per person please. Email must contain a valid phone number and first and last name. You will be notified via email if you win. Tickets will be delivered the week of January 25. Tickets courtesy of Turn To Productions, LLC. Enter to Win a FREE pair of tickets to see Mickey Gilley Saturday, November 7! Want to see Mickey Gilley for FREE on November 7? Drop us a line with your name and phone number and you’ll be entered to win a pair of tickets absolutely FREE! HURRY!!! Contest ends Saturday, November 7 at noon! Enter to Win a FREE pair of tickets to see Michael Bolton Thursday, Nov. 5! Want to see Michael Bolton for FREE on November 5? HURRY!!! Contest ends Thursday, November 5 at noon! 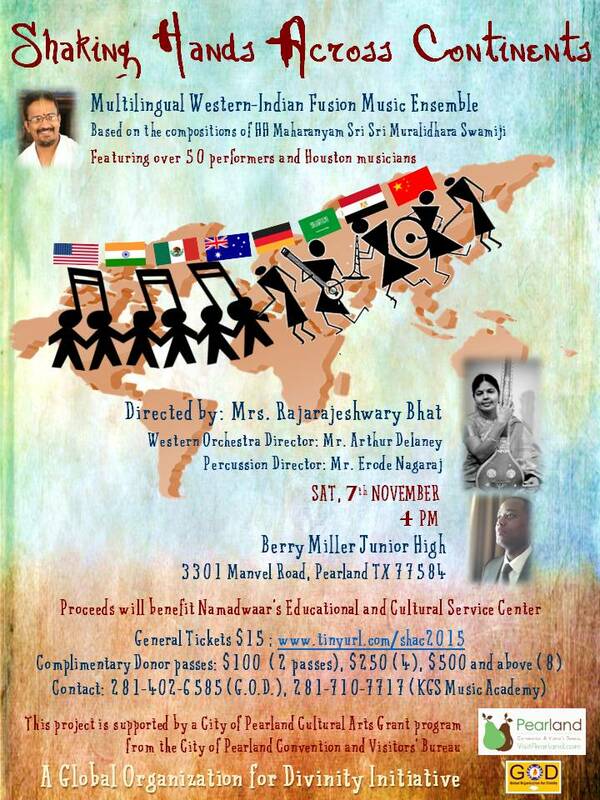 Shaking Hands Across Continents, a Western-Indian music ensemble, directed by acclaimed Houston musician Mrs. Rajarajeshwary Bhat and organized by Global Organization for Divinity, will be presented on Saturday November 7th at Berry Miller Junior High School stage, 3301 Manvel Road, Pearland TX. This project is supported by the City of Pearland through the Cultural Arts Grant from the Pearland Convention and Visitors’ Bureau. The concert, that will present a melodious fusion of Indian and western music, will feature songs in English and multiple Indian languages composed by His Holiness Sri Sri Muralidhara Swamiji of India. A highlight of the presentation will be a world unity song sung in 16 different global languages. The concert will bring together over 50 performers of all ages comprising of several accomplished Houston stars, both singers and instrumentalists. It will feature musical instruments from both Indian (violin, mridangam, tanpura) and Western (piano, violin, viola, drums) genres. Mrs. Rajarajeshwary Bhat is the director of Houston’s Krishna Gana Sudha Music Academy, where she teaches the south Indian ‘Carnatic’ form of music. She hails from a family of musicians in India and has numerous national and international accolades to her credit, both as a musician and a teacher. Apart from coordinating and performing Carnatic music concerts and presentations, she has also worked on several collaborative music productions with various genres of world music. Houston’s Mr. Arthur Delaney, CEO of Delaney Studios – pianist, string instrumentalist and orchestra director – will join hands with Mrs. Bhat in this fusion production. Mr. Erode Nagaraj, mridangam player of international fame, will also take part in this concert. This musical ensemble is organized by Global Organization for Divinity (G.O.D. ), a worldwide nonprofit organization that is very active in Houston, where it is located in the Pearland/Manvel area. G.O.D. aims to promote peace, harmony and universal love amid cultural diversity, and is involved in several cultural, spiritual and social activities around the USA and the world. The proceeds from this concert will benefit the construction of Namadwaar prayer house’s youth educational and cultural service center in Pearland/Manvel area. Seating for this event begins at 4 pm. Tickets are priced at $15. Donations for the cause are welcome, and complimentary tickets with preferred seating will be given to donors. Tickets and donation options are online at http://tinyurl.com/SHAC2015. For more information about Global Organization for Divinity, please visit www.godivinity.org or call 281-402-6585. Pearland Connection has 20 FREE tickets to give away to fans! Give us a shout and include your name, email address and phone number and we’ll let you know if you won! Contest ends at noon on Thursday, Oct. 15. Tickets will be available at Will-Call on the date of performance. THE MIDTOWN MEN are a high-octane musical tour de force that took the Jersey Boys phenomenon to Broadway and beyond, bringing to life the greatest hits of the Sixties, and rocking performing arts centers and symphony halls across the continent. Following the development of Jersey Boys and an historic three-year run on Broadway, principal cast members formed THE MIDTOWN MEN to fully realize the dream they had brought to life playing the iconic Four Seasons. They are the first vocal group ever formed by the principal cast of a high-profile Broadway show, and are lifting audiences to their feet in venues across the continent. Tour highlights for these four Broadway vets and their powerhouse seven-piece band recently included a triumphant return to their “Jersey” roots with a live concert special at the New Jersey Performing Arts Center broadcast on PBS. Pearland Connection has 20 FREE tickets to give away to fans! Give us a shout and include your name, email address and phone number and we’ll let you know if you won! Contest ends at noon on Friday, Oct. 9. Tickets will be available at Will-Call on the date of performance. During Charlie Daniels’ 50-year career, he has scored hits on the rock, country, pop and Christian charts and counts his awards from the Country Music Association (CMA), Academy of Country Music (ACM), TNN/Music City News Awards, and the Gospel Music Association (GMA) among his many accolades. Born in Wilmington, NC, he was raised on a musical diet that included Pentecostal gospel, local bluegrass bands, rhythm & blues, and country music from the radio, including Nashville’s 650 WSM. His signature song, “The Devil Went Down to Georgia,” topped both country and pop charts, bringing him international acclaim. Skilled on guitar, fiddle, and mandolin, his contributions to country and southern rock are legendary on the path of platinum that’s carried him to virtually every music industry award and accolade presented across multi-genres. The CDB’s current release is Off the Grid-Doin’ It Dylan, a tribute to Bob Dylan. Little could Charlie Daniels have imagined in the late ’60’s as a young studio musician answering a call from producer Bob Johnston to add his creativity on guitar to three of Dylan’s Nashville produced projects (Nashville Skyline, Self Portrait, and New Morning,) that he was on the first steps of the journey to his own destination as a musical icon. The Marshall Tucker Band got its start in Spartanburg, S.C. when Doug Gray teamed up with Tommy Caldwell and Toy Caldwell, Paul T. Riddle, George McCorkle and Jerry Eubanks, borrowing the name “Marshall Tucker” from a piano tuner whose name was found on a key ring in their old rehearsal space. In years to come, The Marshall Tucker Band would wow critics and influence major country acts like Alabama, The Kentucky Headhunters, Confederate Railroad, and Travis Tritt with its definitive blend of rock, rhythm & blues, jazz, country, and gospel. With hit singles like “Heard It In a Love Song,” “Fire On The Mountain,” “Can’t You See,” and “Take The Highway,” The Marshall Tucker Band earned seven gold and three platinum albums while they were on the Capricorn Records label. For more information, visit The Arena Theater site. The 3rd Annual Pearland International Festival will be held on September 19, 2015 from 11 a.m. to 9 p.m. at Pearland’s Independence Park, located at 3919 Liberty Dr. and John Lizer Road. Organizers of the International Festival, the Pearland Foundation for the Performing and Visual Arts, secured the date for this year’s festival, which will feature an emphasis on countries bordering the Mediterranean Sea. Two stages will feature music and dance that spans the globe. Strolling entertainers also are featured throughout the festival. The Avenue of Nations features more than 30 exhibits of diverse cultures from around the globe. The International Trade Zone offers unique shopping opportunities. The H-E-B sponsored International Kids Zone offers children’s entertainment and hands-on make-and-take activities for the entire family. The International Boulevard of Food boasts taste-tempting cuisines from all over the world. Admission fees vary. Children under the age of 12 are free. Students – with valid ID – are $2. Adult admission is $10. Additionally, there will be a VIP tent this year. Admission to the VIP tent is $40. Vendor Booth & Sponsorship opportunities available. For more information about the Pearland International Festival, visit http://www.PearlandiFest.org or email Info@PearlandiFest.org. Call 281-993-8817 or text Joshua Hari at 832-496-2583.